What is radon? Radon is a radioactive gas that comes from the decay or radium in the soil. Radium is a decay product of uranium. Uranium is present in almost all rocks and soil and materials derived from rocks. Radon is a colorless, odorless, invisible gas that occurs naturally. Chronic exposure to elevated radon levels has been linked to an increased incidence of lung cancer in humans. In fact, radon is the second leading cause of lung cancer. Many homes, particularly homes in the upper Midwest, contain radon concentrations that are high enough to give their occupants lifetime exposures of the same size as those received by underground miners who showed the increased risk of lung cancer mortality. CAS recommends having your home tested for the level of radon that may be occurring in your home. You will need to fix your home if the radon level is confirmed to be 4 picocuries per liter (pCi/L) or higher. Radon levels less than 4 pCi/L still pose a risk, and in many cases may be reduced. What is the most accurate way to measure radon levels? Continuous electronic radon monitors generally produce the most accurate radon measurements. However, they are expensive and can be difficult to operate. CAS has the equipment necessary for assessing your radon levels. The process takes a minimum of 48 hours at a minimal cost to the homeowner. In addition, year-long measurements by alpha-track (ATD) detectors in your living spaces provide adequate measurements for decision making. In most homes, radon varies dramatically from day-to-day, week-to-week, season-to-season. This means that if you want to assess your long-term exposure to radon, you need to measure over a period of a year or more. In addition, we feel that you only need to know your average radon exposure to an accuracy of about 25% in order to make a decision about what steps you might take to reduce your radon exposure. CAS can fill your radon testing needs, and will insure your home's occupant's safety. CAS is NEHA-NRPP qualified to assess your radon levels and to provide mitigation, if necessary. There are several ways to mitigate radon in your home. 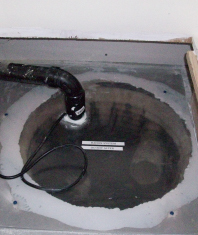 One of the most popular methods is to install a Radon Reduction System. The average cost of installing this system is between $900 & $1200, while it can go as high as $2500. There are additional techniques in mitigating radon, ranging from Subslab Suction to Private Well Water systems / aeration. Contact CAS for more information regarding types of mitigation techniques.